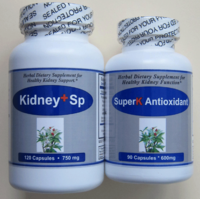 Each GS-kit contains one bottle of Kidney+SP and one bottle of SuperK-antioxidant. This product combination are recommended for supporting people suffering from chronic glomerulonephritis, glomerulosclerosis (FSGS) or IgA nephropathy with high creatinine and/or high proteinuria (high protein spillage in urine). Proprietary blend: Ganoderma lucidum, Smilax glabra, Polyporus umbellatus. Suggested Usage: As a dietary supplement, take 3-4 capsules each time, two times a day, or as suggested by a healthcare provider. Kidney+SP and SuperK-antioxidant were designed by medical doctors and master herbalists from high quality concentrated unique herbal extracts, such as rare herbs Polyporus umbellalus, Ligusticum wallichi, Orthosiphon aristatus, Ludwigiua adscebdens which are traditionally known for their positive effect for healthy kidney and urinary function.These products are considered natural dietary supplements. We use only the purest, superior quality ingredients in all of our products, including Kidney+SP. Our products are free from common allergens, food colorings, preservatives, binders, and fillers including gluten, corn and dairy and they are fully in compliance with industry standards and guidelines for purity of foods and dietary supplements. Note: GS-kit effectiveness may be enhanced by taking Kidney -Tonic for complete kidney support.